Three fire appliances had to tackle a house fire in Eastleigh tonight after one unlucky householder tried to get his log fire going with an accelerant believed to be lighter fuel. 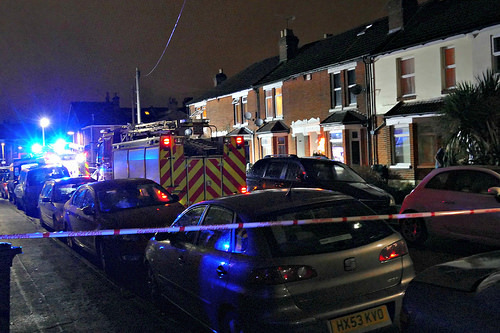 Bellevue Road in Newtown was closed to traffic as firefighters from Eastleigh quickly brought the blaze under control at about 10 pm. Bellevue residents praised Hampshire Fire and Rescue for their swift response and the house showed little external damage although the ground floor windows were blackened with soot. A couple and their pet cats escaped unharmed and raised the alarm. 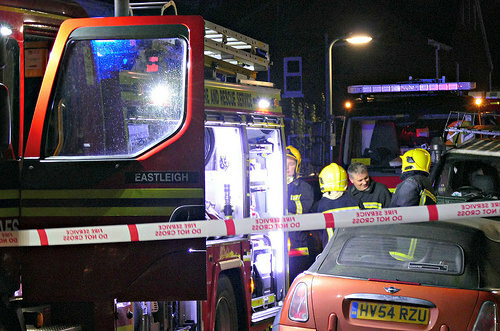 The next door neighbour told Eastleigh News she had to wake her small children and get them out of the house. The unlucky householders are currently waiting to hear if they will be able to return to the property tonight.